All right frugal-friends, time to go on the hunt for something that you’ve buried somewhere for the winter months; your ice-skates. I realize that this is an odd request and that I’ve most likely raised a few eyebrows, but it’s for a good reason. For a limited time at Sportchek locations, they are offering totally free skate sharpening. I’m aware that the paid service isn’t the priciest thing, but it does add up after a while and hurts your fragile budget. There’s really no catch to this deal; all you need to do is walk in, present your skates and they will be sharpened. Each customer gets a maximum of three skate sharpening per visit from August 1st to August 13th. 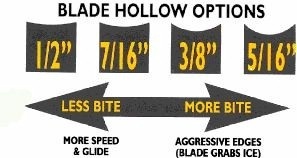 Now, before I start to get comments about skate sharpening services in general, make sure to take a look at your skate and at what Blade Hollow option you need to get it sharpened at. Huh? Don’t worry, let me explain: The basic cut for sharpening is what they call a 1/2″ which is the beginner setting and the common setting that they will sharpen your skates at if they aren’t told differently. Take a peek at the chart below to get a better gauge at what option you need–or, if you are confused right now, just let them do the basic cut to save you the headache. If you want to know more about it, just click the link I’ve listed below! Happy Hunting! Find out more about Skate Sharpening in general. Find out more about this deal at the Sportchek Facebook page.